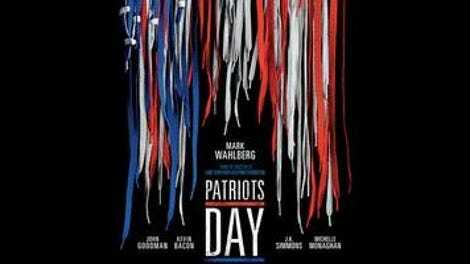 A sprawling civic procedural about the 2013 Boston Marathon bombing and the manhunt it touched off, Patriots Day by and large withstands the inevitable charges of too-soon opportunism, exhibiting some of the very same traits it extols in its local-hero characters—namely, diligence, competence, and a proportional sense of urgency. Director Peter Berg, collaborating here for the third time with star Mark Wahlberg (after the 2014 surprise hit Lone Survivor and this fall’s ripped-from-the-headlines disaster film Deepwater Horizon), has made a tribute to cooperation under fire—both between overlapping law-enforcement jurisdictions and the members of a shell-shocked yet resilient community at large. But the movie, none too revelatory, mostly just stands as a sturdy thriller, one that’s more fleet than flat-footed as it shuttles among a veritable network of characters and story lines. At the head of the group is one of the film’s few miscalculations, Tommy Saunders, a composite figure cobbled together from several real-life members of the city’s police department. Boston native Wahlberg, furrowing his brow even harder than usual, acquits himself well enough in the role, but that doesn’t prevent Saunders, transparently more of a fictional creation than most of his fellow characters, from becoming something of a dramatic liability. He’s a sort of regular-guy cipher, a man with a loving wife (Michelle Monaghan), a bum knee, and a strong nostalgic streak. (During the ominously calm night-before opening of the film, he’s seen swilling a beer and organizing a shoebox full of baseball cards.) Saunders also happens to be subject to some kind of sketchily explained disciplinary action at work, which is apparently why police commissioner Ed Davis (John Goodman) has him working the finish line on the day of the marathon. The ostensible protagonist might not feel wholly authentic, but Berg, working from a screenplay he wrote with Matt Cook and Joshua Zetumer, puts into play many characters who do, allowing the film to credibly approximate a sense of metropolitan bustle. The cleanly linear Patriots Day, with its surplus of swooping aerial shots, tracks a number of Bostonians who found themselves at the center of these tragic events—not only law-enforcement officers but also residents who wound up in the wrong place at the wrong time (among them, a yuppie couple played by Rachel Brosnahan and Christopher O’Shea, and a lonely Chinese immigrant played by Jimmy O. Yang). Still other subjects include Tamerlan (Themo Melikidze) and Dzhokhar (Alex Wolff) Tsarnaev, the brothers behind the pressure-cooker bombs. The film doesn’t display much interest in exploring the siblings’ motives, but neither does it paint these dead-eyed culprits in broad stock-villain strokes. Wolff, in particular, gives one of the movie’s best performances as Dzhokhar, a case study in detachment and casual malice; after a carjacking in which he forces the victim to stay in the vehicle, Dzhokhar has the chilling absence of mind to ask if there’s Bluetooth on board so he can listen to the music on his phone. Berg—a master of pyrotechnics, as the thousand-alarm fire of Deepwater Horizon recently reaffirmed—thankfully moves rather quickly past the explosions themselves. Instead, the dramatic emphasis here falls on the hunt for the two young men who sought to sabotage this day of municipal goodwill. FBI special agent Richard DesLauriers (a vaguely nerdy Kevin Bacon) steps in to head up the frantic search, with clutch on-the-ground assistance from Saunders and Jeffrey Pugliese (J.K. Simmons), the police chief of Watertown, a nearby community to which the Tsarnaevs eventually flee. In one of the film’s tensest exchanges, DesLauriers furiously lashes out after he receives word that pictures of the suspects, which he doesn’t yet want to go public, have leaked to the press. It’s a sharp illustration of the many spheres of influence, both federal and local, that this particular investigation has brought into collision, making for inevitable crossed signals up the chain of command. Refusing a wholehearted endorsement of operational realpolitik, Berg also doesn’t overlook the unsavory side of some of the methods used to expedite the Tsarnaevs’ capture: Saunders reacts with disbelief when he’s told not to Mirandize the suspects should he come across them; after Deval Patrick (Michael Beach), the governor of Massachusetts, makes the call to put the capital on lockdown, someone in the war room squeamishly asks if he’s really comfortable with a measure that skirts so close to martial law. Meanwhile, the electronic score by Trent Reznor and Atticus Ross helps sustain the on-edge atmosphere, its chimes and drones serving as fitting aural correlatives to the film’s fairly woozy visual register. Indeed, Patriots Day finds Berg working in his preferred aesthetic mode of handheld commotion—in which the twitchy camera itself often seems to be in search of the focal point of any given scene (an approach enabled here by cinematographer Tobias A. Schliessler, a frequent Berg collaborator). But as ever, the apparent immediacy of the style belies the fact that the director’s primary allegiance is not to what actually happened but rather to the folks in the audience. As a result, Berg winds up making crowd-pleasing gestures that a comparatively austere filmmaker like Paul Greengrass—that more senior practitioner of crisis realism—would not so readily permit. 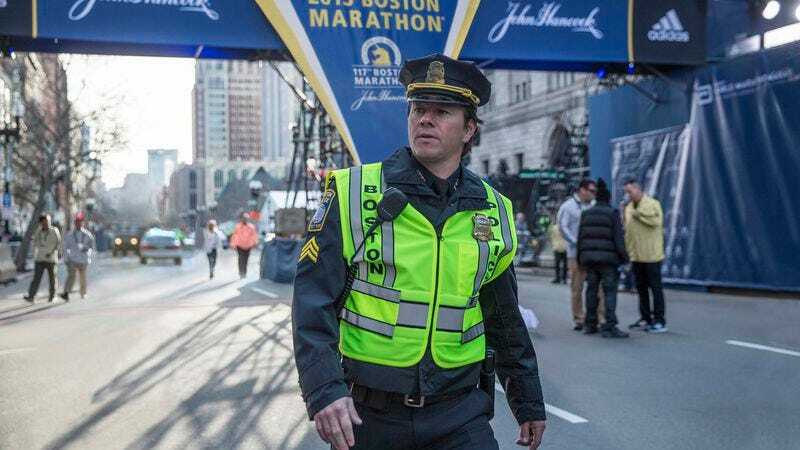 In Patriots Day, these include a surprising amount of tension-defusing quasi-comic dialogue, as well as an enormously treacly (and undeniably effective) epilogue in which the real-life subjects finally get their say. Whether it’s unseemly to fashion this kind of serious entertainment out of such recent events is up for debate. That this is, for all its weak points, an engaged and gripping film—one that earnestly strives to do justice to its subjects—is plainer to see.